We were shoveling snow one day this week then wearing flip flops a few days later – spring has finally arrived in Saskatchewan! I’m hoping that we’ve seen the last of the snow here until Christmas but I have a feeling we may see another snowfall before we drag out our patio furniture. We have a long list of outdoor activities we’d like to try this year like teaching my son to ride his tricycle (he doesn’t want to pedal), checking out more of the playgrounds around the city, taking a summer road trip, teaching my son how to play baseball and watching my son play on his first soccer team. His first soccer game is at the end of this month (actually landing on my husband’s 39th birthday) and we’re so excited to see him play! I have a feeling he’ll run to the wrong goal net, he’ll pick up the ball and carry it instead of using his feet, and he’ll probably spend most of his time giggling but we can’t wait to see him in action! His soccer games will be two nights a week so we’ll need some quick & healthy recipes to keep his energy levels up. 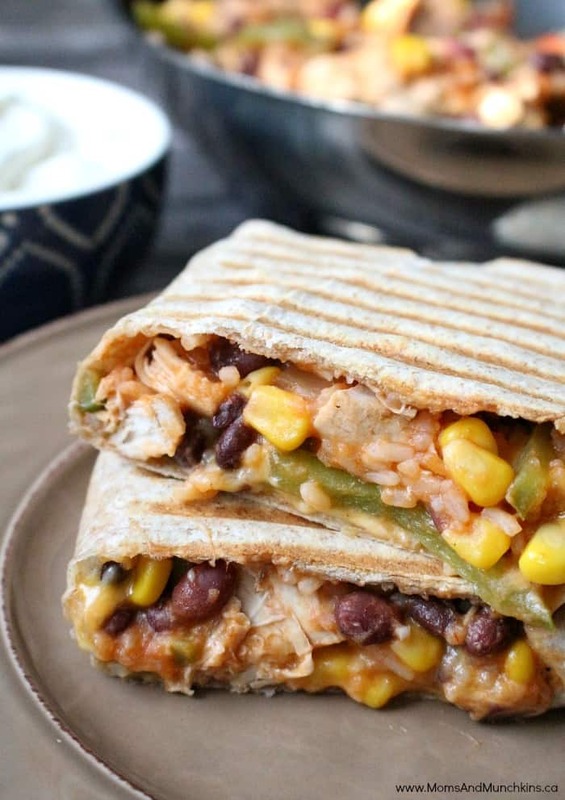 On the Chicken.ca website, you’ll find a large selection of both quick & healthy recipe ideas. I chose a Lime Salsa Chicken recipe and turned it into a Lime Chicken Burritos meal. With just two chicken breasts, we had 5 large burritos! I love the recipe search features on the Chicken Farmers of Canada website. They have ideas for all sorts of dietary restrictions and preferences. You can search for low sugar meals, low carb, gluten free, diabetic friendly and more! They make it so easy to search for recipes your family will love. To simplify the meal planning process even further, you can download the free Shopping With Chicken App that will help make your grocery shopping list based on the recipes you’re planning on making this week. With Cinco de Mayo right around the corner, I’m expanding my recipe book with delicious Mexican-inspired meals. 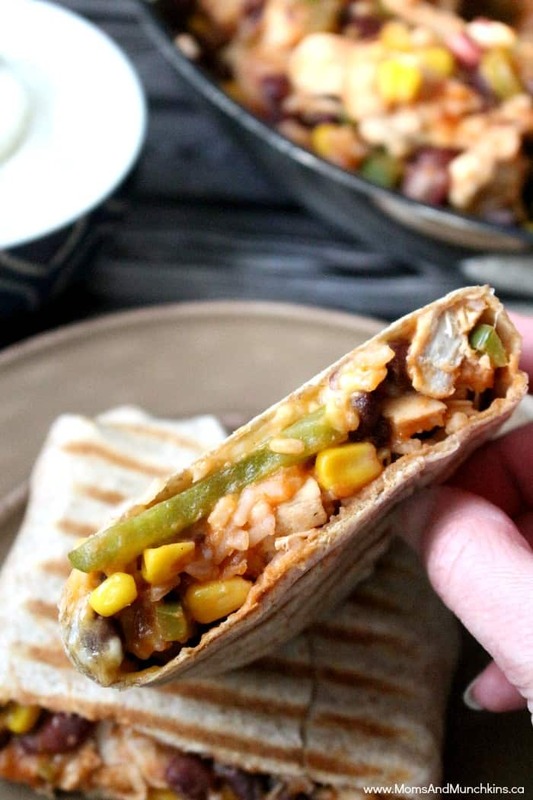 This Lime Chicken Burritos recipe is so easy to make and you’ll have enough leftovers for lunch the next day! You can use mild, medium or hot salsa depending on your taste preference. In a large frying pan, fry the chicken until fully cooked. Add green pepper, mushrooms, corn and black beans and cook over medium heat. Add the juice from two limes and stir well to mix. Add the salsa & rice and stir well to mix. Cook for about 5 minutes over medium heat. Spoon mixture into tortilla shells (not so full that you can't close them) and sprinkle with cheese. After I roll the burritos, I grill them for a few minutes in the panini press so that they hold their fillings better. These are really easy to make and are packed full of flavour. With the leftovers, you can turn it into a taco salad, tacos or more burritos for lunch. Our snow here is pretty much gone, but it’s still cold! This recipe looks yummy. I use my slow cooker year round. Yes, still pretty chilly here too. Probably still another month before I’ll put away my warm “comfort food” recipes.